Unicity's Indigenously Made Unicity Activate, With Botanical Extracts Is Very Unique and Different Taste And Diverse Health Benefits With A Feel Of Well-Being. 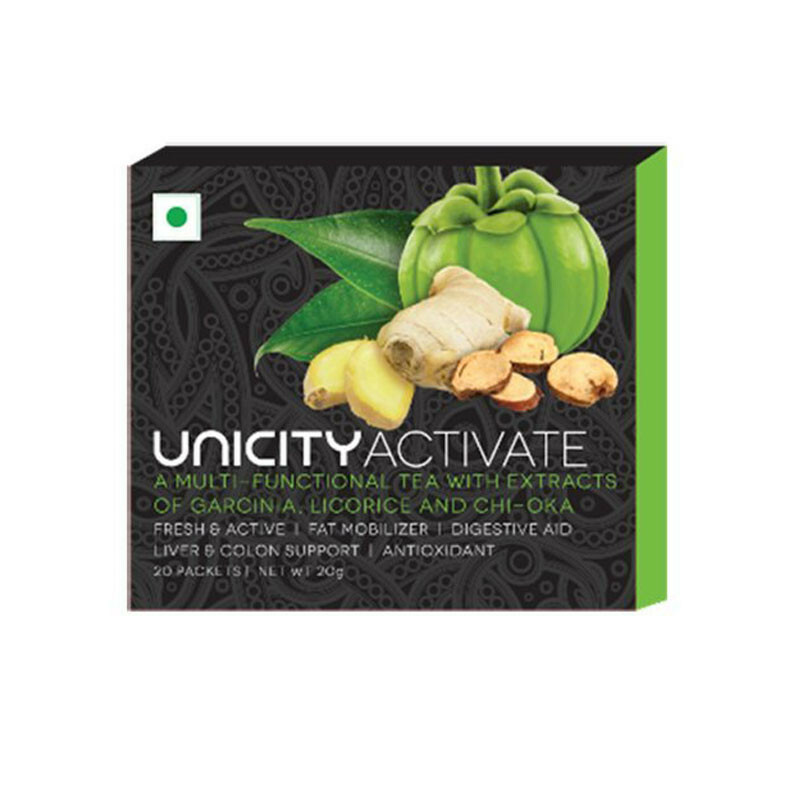 Unicity ACTIVATE is easy to make anywhere, anytime and it has no sugar added in the product.It is a multi-functional tea with numerous health benefits and it has a tingling lemon and piperine flavor.Multi-Functional And Revitalizing Drink For Vigorous Health And Taste The Crafting Of Different Types Of Teas Continued To Change Over Time.Unicity's Indigenously Made Unicity Activate, With Botanical Extracts Is Very Unique Unicity Activate's Characteristic, Includes A Different Taste And Diverse Health Benefits With A Feel Of Well-Being.It's An Exclusive Combination Made Better With The Licorice Extract, Chi-Oka Matcha, Green Tea Extract, Garcinia Extract, Ginger Extract And Piperine. Unicity Activate Comprises Of Licorice Extract -Beneficial For Respiratory Health, Colon And Liver Support, Acts As A Mild Laxative, Relieves Acid In Stomach, Aids In Relieving Heart Burn And Indigestion. Chi-Oka Provides A Feeling Of Well-Being, Improves Mental Alertness, Keeps You Active And Fresh With A Great Feeling Of Serenity Apart From Being An Anti-Oxidant. Green Tea Extract Is Not Allowed To Oxidize, And Hence Retains The Polyphenol Catechins And The Flavonoids Which Makes Drinking Unicity Activate A Healthy And Beneficial Option With Anti-Inflammation And Anti-Carcinogenic Properties, Optimizing Health, Anti Oxidizing With Protection Of Heart And Other Degenerative Diseases. Garcinia Supports Fat Mobilization And Boosts Metabolism. Ginger Aids In Alleviating Motion Sickness, Nausea And Vomiting Sensation.